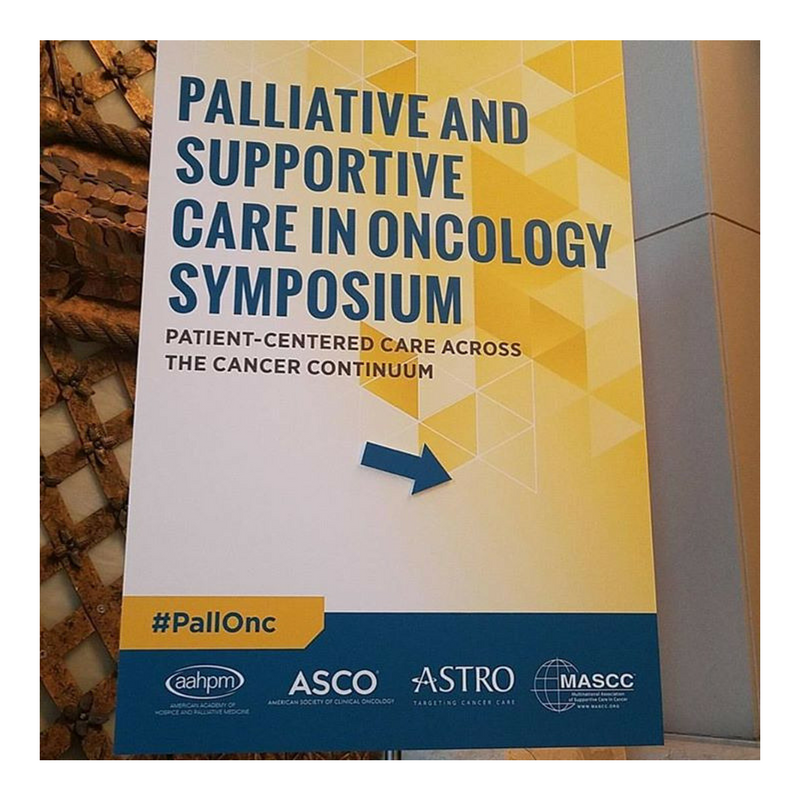 It is a testament to the growth and mainstream acceptance of palliative care, that there is a sub-sub-specialty two-day conference like the #PallOnc conference held in San Diego this past weekend. If you have not heard of this meeting yet, and the majority of your work in that intersection between oncology and palliative care, I would highly recommend considering it in the future. This is the 4th consecutive year the meeting has been held, and I applaud the commitment of the four co-sponsoring organizations (AAHPM, ASCO, ASTRO and MASCC). Kristina Newport and Shanthi Sivendran reviewed this conference for Pallimed in 2014 and it was one of our most popular posts. They went on to create the very popular Oncologist in Your Pocket pre-conference at the 2017 Annual Assembly of Hospice and Palliative Care. Clearly there is a hunger for this information! With two-days of talks and over 150 posters, there is a lot to cover, but let me share some of my key takeaways and highlights of the symposium. 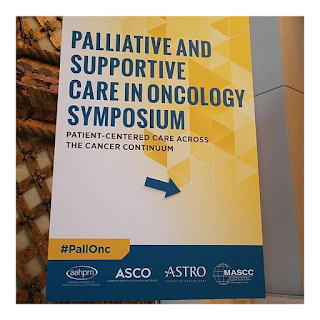 For more detailed coverage you can check out the transcript at Symplur or the pallonc.org website (paywall). The research presented Friday helped define what is involved with early integrated palliative care that makes it successful. Hoerger and colleagues presented analysis of palliative outpatient visits where the clinicians marked what they did immediately after the visit was done. Coping and symptom management were consistent through nearly all visits. Rapport and illness understanding were important early, where as treatment decisions and advance care planning were more important in later visits after trust had been established. While this may seem intuitive it is helpful to have more solid research behind what exactly palliative care that makes it effective. Dr. Haider and his peers presented a detailed examination of how computers impact patient perceptions of empathy, communication and compassion. If you can take a wild guess, patients preferred the doctor in the vignette where they didn't use the computer. This seems intuitive, but again the research helps set the foundation for how we integrate point of care documentation (efficient, now bedtime charting), immediate access to scans and labs (to facilitate discussions with patients), while still being focused on the patient. Some people use scribes, other people do joint documentation with team members. And it brought up a very palliative moment in the Q and A! In the afternoon Sandra Mitchell (NCI) had a great session on fatigue during and following cancer treatment. While it is difficult to read some of the headers, I htink this is a smart approach to presenting data on symptom management, with green = good data, and red = less data. As you might see low-dose dexamethasone is on the red side. So maybe those of us seeing some good results from that, need to publish better data (or readdress on own biases). One consistent theme was the importance of non-phamacologic management. What unfortunately was not routinely addressed was how to access CBT, acupuncture/acupressure, massage, psychology and others. I feel relatively lucky but occasionally frustrated at how to get my patients access to these services on a consistent basis to meet their needs. It is one thing to hear about how great they are at a conference, but another thing to get them implemented in your practice. If anyone has stories of success please share them with us! More coverage on day 2 tomorrow! Christian Sinclair, MD, FAAHPM is editor of Pallimed, and a palliative care doctor at the University of Kansas. He loves that next year's #pallonc conference will be in San Diego again, since that is his hometown!